Our next two day workshop is scheduled for September/October 2015 10am - 4pm both days. If you are intersted in this workshop Click Here to book your place. Next workshop Sunday 5 July 2015. 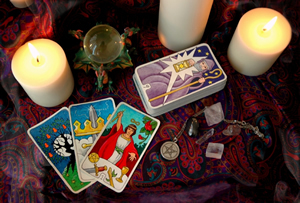 During the day we explore the archetypal meanings of the some of the Major Arcana cards. We also look at the cycles of change and how they are indicated and described by certain of the Major Arcana cards. We take another look at the Minor Arcana and the different myths and legends that play out in the suits as well as some interesting spreads including past lives. If you would just like a reading click here to find out more.